Seeing, hearing, touching, tasting, smelling suffering! Sensing the presence of tormented souls cannot be fully expressed in words only shared inadequately by tears. The first stop was Nuremberg in Germany, which started a journey in the reverse order that marked the Holocaust. The famous Nuremberg trials may have been held here but they were too late to reverse the horror. The second stop was Flossenburg Concentration Camp in Germany, which is only one concentration camp of over 300 established by the Nazis in Europe, as shown by a map there. Flossenburg is where the SS interrogated and tortured prisoners. Most of the over 100,000 men, women, and children taken here are identified in a large registry book. The towns’ people were complicit in utilizing free labor from the prisoners. The third stop was Auschwitz in Poland, the most notorious of the camps, which led to the deaths of over 1.1 million souls, over 90% of whom were Jewish. 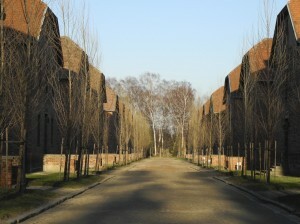 The cyanide gas chambers were directly adjacent to the crematorium. Rows of building blocks housed unfathomable horrors. Women were used as human guinea pigs for sterilization experiments conducted by Prof. Dr. Carl Clauberg, a German medical gynecologist. Some died from the treatment and others murdered so that autopsies could be performed. Other SS medical doctors conducted many other experiments. Though my father fought against the Nazis in the European theater it doesn’t eliminate my sense of collective conscience and consciousness embedded in my personal history. My last name is Hesse. My ancestors were German. My faith is Catholic, which together with Protestantism, were the main sources of Nazi soldiers. I share in this horror. So where is the final stop on this journey? There can be no stopping in the search for truth and acts of love. Even with advanced degrees in medicine and science my generation is just as capable of allowing the government to take away peoples’ freedom. Changing the world can only start with me as Blessed Mother Teresa said: “Spread love everywhere you go. Let no one ever come to you without leaving happier.” Tomorrow is Christmas!